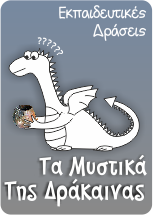 Today Drakaina Cave is a shallow but well protected rockshelter located on the steep cliffs of the Vochyna gorge within the area of the village Poros on the southeast coast of Kefalonia, an island in the Ionian Sea. The site preserves a Late Neolithic to Early Bronze Age sequence in addition to cultural remains dated from the Late Archaic to Hellenistic times.The neolithic layers are characterized by several successive well-preserved plaster floors. 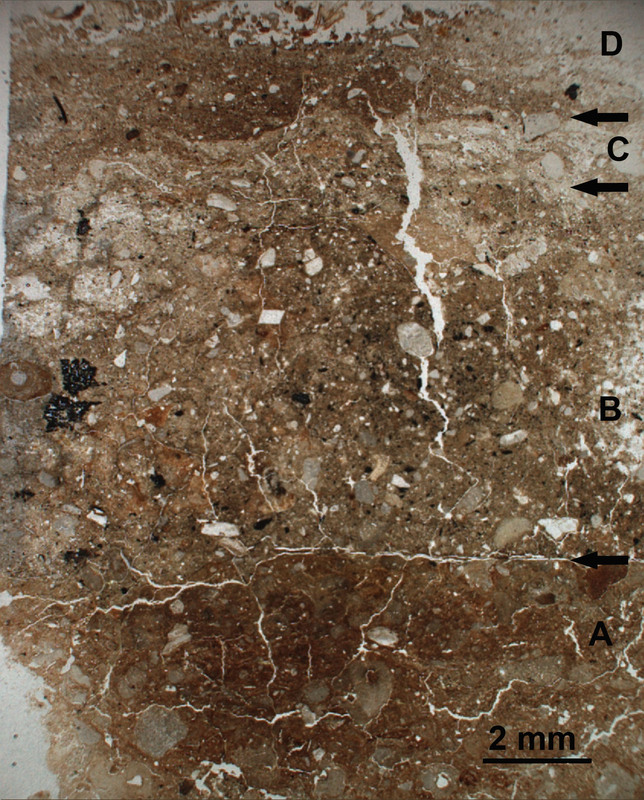 These constructed floors along with the relating archaeological sediments were examined using micromorphological techniques, which involve the study of petrographic thin sections produced by resin-impregnated, undisturbed blocks of sediment. Thus, the microstructure and constituents of the plaster floors as well as the enclosing archaeological sediment are studied in relation to each other. At Drakaina, lime plaster was identified as the construction material of the floors, which consist of successive micro-layers without defined boundaries. The lower micro-layer is usually a mixture of lime and a large amount of waste from previous activities in the cave. In some of the plaster floors a distinct micro-layer with a reddish tint is observed consisting of a mixture of clay and lime as well as a large amount (30-40%) of limestone fragments with signs of incomplete transformation to quicklime during the burning process. The next micro-layer differs from the previous one in that it does not contain any clay admixture. Finally, a whitish lime wash-coat is locally preserved. 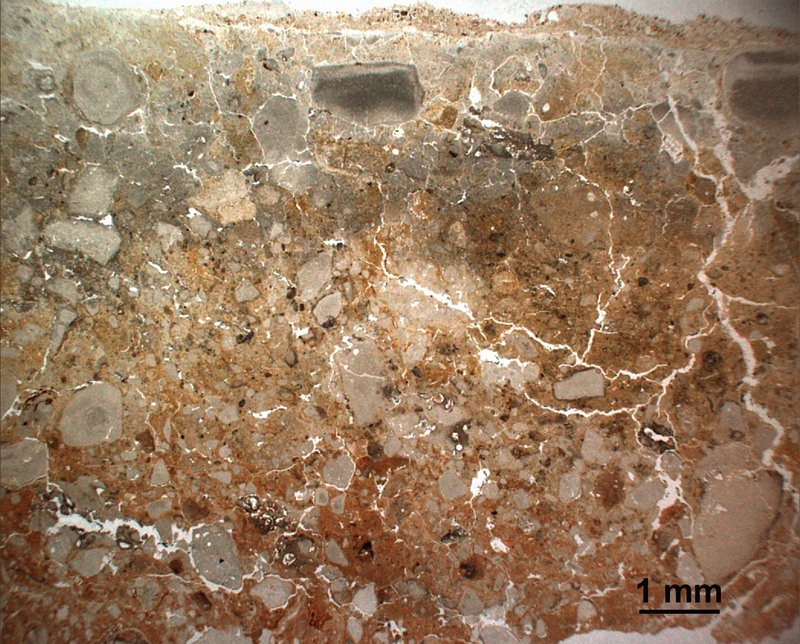 The incompletely transformed limestone fragments contain large amounts of foraminifera and occasionally can be classified as impure argillaceous limestone (marl). It is thus concluded that the raw material used for the production of lime was the soft Neogene marl and limestone found in the nearby areas of the site and not the recrystallized Triassic-Jurassic limestone in which the cave is formed. The presence of large amounts of lime lumps and incompletely calcined limestone as a form of plaster aggregate is most likely the product of traditional “hot mixing” or dry slaking techniques used probably on place and not the product of a mortar mixed with matured putty. In several places the upper part of the lime plaster floors is transformed to phosphates as the result of post-construction alteration. This alteration is assigned to the action of phosphate-rich solutions related, most likely, to food processing. The enclosed sediment can be described as raked-out hearth materials consisting of microscopic charcoal fragments, wood ashes, burnt bones and soil lumps as well as pottery and plaster fragments. The periodically repeated construction of the lime plaster floors in Drakaina which were time and energy consuming, using the same techniques as well as the same raw material for more than 1000 years suggest –among other things– the significance of the site. The particular method of floor construction combined with possible intensive activity at times, lead to the conclusion that the cave and the surrounding environment was of particular importance to the neolithic community of the area. Fig. 1: Lime plastered floor with a large amount of lime inclusions. Fig. 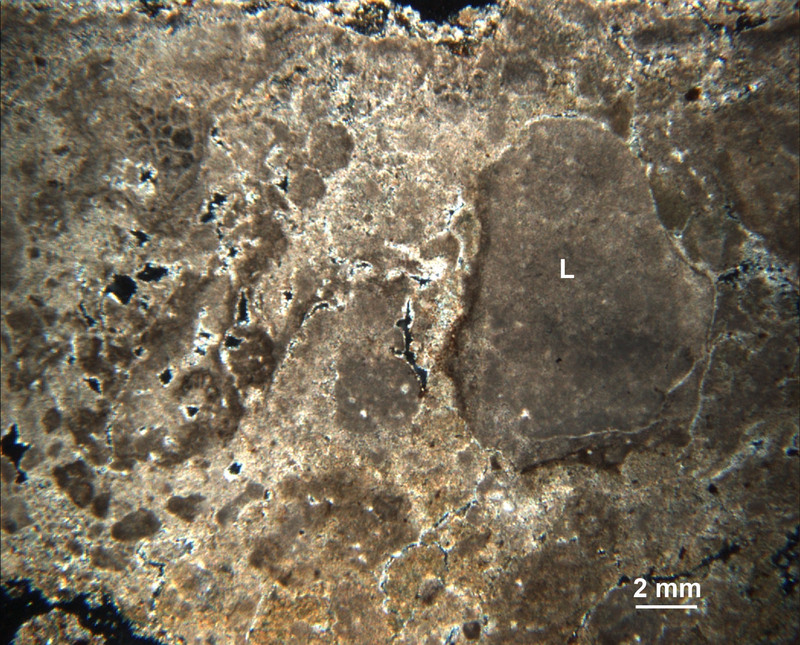 2: Photomicrograph of micritic (L) limestone fragments showing incomplete transformation to lime assimilated in the lime matrix. Note that the matrix also shows dark areas with incomplete crystallization of calcite. Crossed polarized light. Fig. 3: Reparation of a compact plaster floor (A) by applying a thin lime layer (C) on top of the accumulated dirt (B). A new increment of dirt is observed on top of the reparation lime layer (D). Fig. 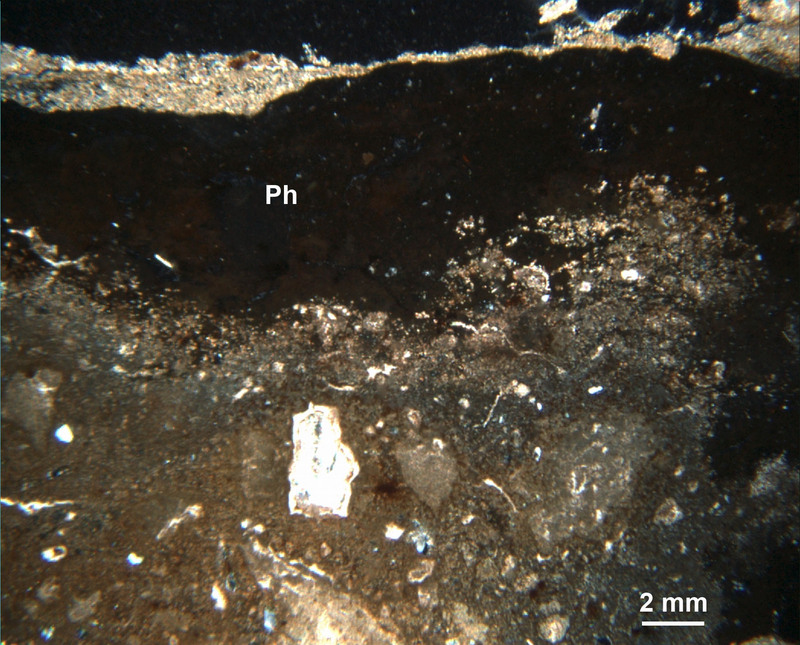 4: Alteration of the surface of a floor sample by phosphates (Ph). The gradual reaction of the black alteration halo with the lime interior of the floor is shown as well as the abrupt upper alteration boundary coinciding with the surface of the floor. Crossed polarized light.